The Japanese Sord M5, launched in October 1982 at the Tokyo Data Show, was one of a handful of computers (a group which included the Sinclair ZX Spectrum and Jupiter Ace) that decided not to provide a standard space bar, instead choosing to offer "space" as a regular function key much the same size as the shift and enter keys, between which it is positioned. It was distributed in the UK by Computer Games Limited - a company known for its Game & Match toys - as the CGL M5. Echoing 1979's Transam Triton, it had different versions of BASIC available for it (in the Sord's case available as plug-in cartridges rather than pre-installed in ROM) - an integer-only variant called Basic-I, a graphics-heavy version called Basic-G and a fully-fledged floating-point version aimed at "Scientific, technological and statistical computing" called Basic-F. It ran a 4MHz Zilog Z80-A which, combined with its other specs, including the same sound chip as the BBC Micro and an MSX-identical video chip, made it similar to other pure-MSX machines available at around the same time, like Toshiba and Mitsubishi's models. It retailed for £195 - about £620 in 2019 money - for the version that you could actually do something with, although there was a cheaper model at £150 with only 4K of free RAM - about the same as the VIC-20 from two years before. The M5 didn't do that well. Its price put it in what was called at the time "the ferocious under-£200 market" but it was more expensive than its contemporaries like the Sinclair ZX Spectrum or Commodore's 64 - both of which were well-established and had thousands of software titles behind them. It also seemed to suffer from poor documentation, with Popular Computing Weekly suggesting in its review that owners should get hold of a Memotech manual as that "contains all they should need". Lack of detailed technical information could affect the ability of third parties to write software if information on system variables and the machine's memory map was hard to come by - a problem which contributed to the downfall of Texas Instruments' TI-99/4 and which also affected Atari, which chose to restrict "secret" system information to only developers who would sign a non-disclosure agreement. Said developers all buggered off to write for someone else's machine instead. Despite these issues, its parent company - founded in Japan in 1970 by Takayoshi Shiina - survived and was eventually bought out by Toshiba in 1999, which had previously acquired a 38% stake in the company in March 1985. Sord had been around in the UK since at least the end of 1979, when its 16K M100 machine was available for around £780 (£4,260). For a while Sord even held the position of Japan's fastest-growing company, as sales had doubled in 1981 and its 1982 turnover was estimated to be £40 million. 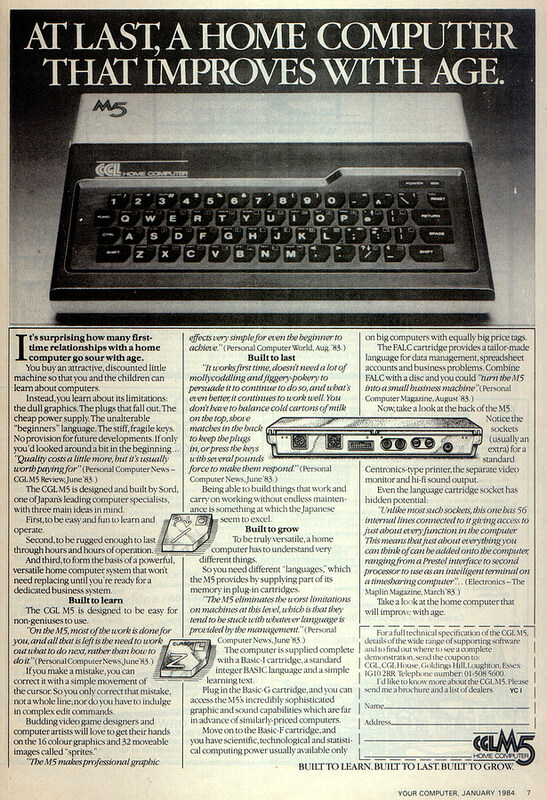 By September 1983, the CGL/Sord M5 was selling for £150 (£500 in 2019 money) and had entered Personal Computer News' Top Twenty chart at number 19. The number 1 at the time was the Sinclair Spectrum, at £99 (£330) with the venerable £150 (£500) VIC-20 still at number 4, beating off competition from its own sibling the C64 at £299 (£1,000) at number 8. This price marked a £40 discount from its previous level at round £190 (£630). Sord were not alone in having to keep up with the savage price wars raging during the latter half of 1983, but at least they were generous to owners of existing machines - if a proof of purchase was taken to a Sord retailer, the owner could pick up a free copy of the BASIC G language, worth £35. When it was announced in the press (it was originally meant to retail for £100), Sord described their own machine, somewhat oddly, as a "variety" computer which was supposed to be capable of anything from "playing intellectual games" to "data processing"
In September 1983, Sord announced its "smaller Sord" competitor to Tandy's portable Model 100 - the Sord IS-11, which came with a proper full-size keyboard, 40x8 LCD screen, built-in micro-cassette drive and an expected 64K memory. It was part of Sord's self-proclaimed attempt to become Japan's largest computer manufacturer "within a few years". It came with two optional add-ons: a pen-plotter printer for the left-hand side and a calculator-type keyboard for the right and was expected to be available in early 1984, along with other machines such as the M-68 and a "32-bitter". The M5 had been received enthusiastically by the press and retailers upon its release, but sales were slow and users were "somewhat out on a limb". As a matter of urgency, CGL launched an intensive development program in early 1984 to "keep the M5 customer satisfied", including announcing more software, with games and educational titles, support and hardware, as well as free membership to a new M5 Users' Club, available to those in possession of a warranty card. This gave access to a support line as well as the obligatory newsletter. Although David Morein, CGL's Managing Director, was a bit tight-lipped about forthcoming stuff, the newsletter did mention the PT5 printer and a 32K RAM pack, with a new M5 disk system promised "soon".